[JOHN HANCOCK]. Newspaper. Massachusetts Centinel, Boston, Mass., June 4, 1788. 4 pp., 9½ x 14½ in. Trimmed close at bottom edge, with minor text loss to pp. 3-4 but not affecting Hancock’s speech. “X”s mark certain columns for reading or copying. 1. The governor and Commonwealth. 4. Speedy completion of the Federal Edifice. 13. Freedom and peace to all mankind. In his second, non-sequential term as Massachusetts Governor, John Hancock addresses his state’s legislature upon re-election to another annual term. 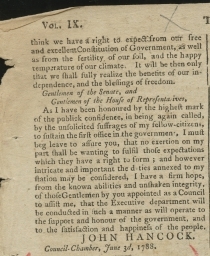 The bulk of his message concerns the impending ratification of the federal Constitution (New Hampshire’s approval just over two weeks later would complete the passage with the required nine states) and the causes that necessitated its creation. The return to “peace and tranquility” referenced not only the fight for ratification, but also Shays’s Rebellion, an early tax revolt in western Massachusetts that demonstrated the weakness of government under the Articles of Confederation. 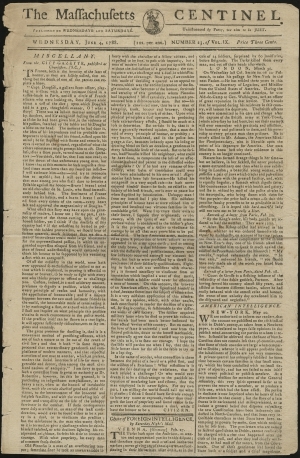 Shays’s Rebellion made clear the need to reform the central government and form a constitutional union, which in turn led to a blistering debate in Hancock’s state. Massachusetts finally ratified the Constitution in February 1788 after Hancock and fellow patriot Samuel Adams endorsed it, along with the scheme to service the public debt through sale of federal lands that was crucial to the Constitution’s success. 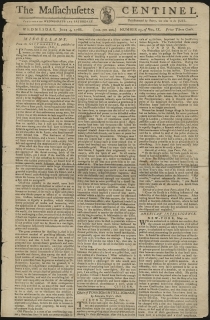 Also includes reports of ratification disputes in North Carolina, the South Carolina Ratifying Convention, the election of officers to the Massachusetts Ancient Artillery Company at their dinner, including a list of toasts, and a resolution returning two Revolutionary War cannon to Massachusetts, among the usual period advertisements.